A recent management initiative along Kedron Brook has been the designation of dog off-leash areas on the floodway. There is an extensive one on the north bank along channelised sections of Kedron Brook in the Gordon Park to Kalinga section of the Brook. The dog-off leash area is long enough for a decent run for the dogs, and has become very popular. Some people travel from several suburbs away to exercise their pets. About ten years ago, the barren floodway was never used. Now it is a local social focal point, a source of pleasure to many and ensures local dogs have an excellent exercise opportunity. Early morning walkers calling or training their dogs disturb nearby residents trying to sleep. The impact of dogs on the natural environment is a concern to some. To date there have been no systematic investigation of the impact of dogs on the local environment. One of the obvious impacts of dogs on this section of Kedron Brook is the formation of ‘runs’ where dogs enter the stream via steep banks. There are signs posted along the off-leash area, forbidding dogs from swimming in the stream. Unfortunately, dogs don’t read and it takes a fit and agile owner of a water-loving pooch to prevent an unleashed dog jumping into the water. A consequence of dogs accessing the stream is the disturbance to local waterbirds (ducks, coots and Cisticolas). These well-adapted birds do take things in their stride and just move away from the dogs. Problems are most likely to occur if the birds rely on nesting in this area. Nesting will be less successful if birds are repeatedly disturbed. The effect of numerous dogs swimming in the Brook could lead to pollution of the water due to a build-up of chemicals and soaps used on dogs’ coats. Additional nutrients may be introduced into the stream when faeces and urine deposited along the floodway, are washed by rain into the stream. The dog off-leash area is an excellent community resource and a relatively new innovation. It is the interest to both dog owners and those with environmental concerns, to work together to protect the local area. Follow the rules for use of the off-leash areas. If your dog is fairly certain to jump into the water when unleashed, make sure it is somewhere where the bank will not be damaged. (Don’t encourage swimming). Dog owners and those with environmental concerns are welcome to join the local Bushcare Group to help improve the environment in this area. 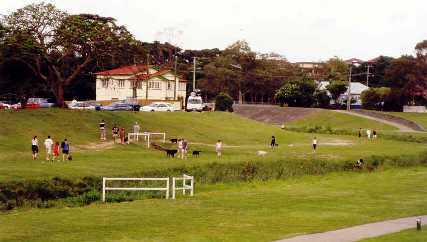 The Lutwyche Reach Bushcare Group will be undertaking work on the stream bank associated with the off-leash area between the Thistle Street Bridge and the Gilbert Road Bridge.